Leicester City were relegated to League One, Bolton Wanderers shone in Europe and Portsmouth won the FA Cup - the season was 2007-08 and Burton Albion were just a footnote in English football as losing Conference play-off semi-finalists. Eight seasons later, Leicester are Premier League champions, Bolton have been relegated to League One and Portsmouth are are in the League Two play-offs after three relegations in five years. As for Burton, they have been promoted to the second tier for the first time in their history. Moving up to the Championship completes "a fantastic journey for a little club", according to chairman Ben Robinson, who first appointed manager Nigel Clough as Brewers boss 17 years ago. BBC Sport looks at just how dramatically the football landscape has changed since Burton were fighting to gain Football League status in 2008. 2012-13: League Two play-off semi-finalists, losing to Bradford City over two legs. 2013-14: Beaten by Fleetwood in League Two play-off final. 2014-15: League Two champions and promoted to third tier of English football for the first time in their history. 2015-16: Second in League One in their first season of third-tier football, promoted to Championship for first time. BBC Radio Derby's Owen Bradley: "Burton Albion announced themselves to the football world with their FA Cup third-round exploits against Manchester United in January 2006. "The following season, the Brewers were still revving their engine ahead of the remarkable run up the Football League ladder. Trips to glamorous venues including Droylsden, Farsley Celtic and Ebbsfleet's Stonebridge Road remained the norm until promotion in 2009. "Stuttering over the line to the Conference title betrayed little about what was to come. Paul Peschisolido consolidated - and shocked Middlesbrough in the FA Cup - before Gary Rowett took the reins and Burton's star started to shine. "His first season in charge led to defeat in the play-off semi-finals; his second, a heartbreaking loss to Fleetwood at Wembley. "The Brewers haven't looked back since that day. Rowett laid further foundations for promotion before Jimmy Floyd Hasselbaink finished the job. In turn, the former Chelsea striker set things up for Nigel Clough - the man who started it all - to return and guide Burton to the Championship for the first time. "From Histon to Hillsborough, from Northwich Victoria to Villa Park. It has been quite a journey." 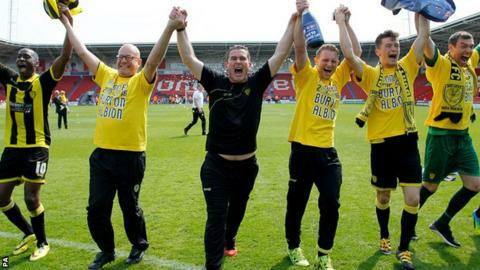 Clough said the supporters who spilled onto the pitch in Doncaster on Sunday to celebrate promotion exemplified Burton's journey from non-league minnows to a club preparing to join a league that includes two former European champions - Nottingham Forest and Aston Villa. "Too see the sea of yellow and black is incredible - we used to get 400 or 500 in the Southern League, now there are thousands out there celebrating - it's absolutely remarkable," Clough continued. "To come from where we have come from in that time is incredible in football terms." Their rise up the football ladder has been as remarkable as Leicester City's astonishing transformation from a side relegated to the third tier eight years ago, to champions of England for the first time in their 132-year history. 2007-08: Relegated to League One. 2008-09: Promoted back to the Championship as League One champions. 2012-13: Losing Championship play-off semi-finalists. 2013-14: Promoted to Premier League as Championship winners. 2014-15: Won seven of their last nine games to avoid relegation from the Premier League. 2015-16: Premier League champions, collecting a first English title in their 132-year history. The glamorous European ties the Foxes now get to look forward to are just a thing of the past for Bolton, a club that eight seasons ago beat Atletico Madrid in the Uefa Cup. As the Trotters prepare for life in League One, Atletico are preparing for the second all-Madrid Champions League final against Real. 2007-08: Reached Uefa Cup last 16, beating Atletico Madrid over two legs in the round of 32 after drawing 2-2 against Bayern Munich in the group stage at Allianz Arena. 2011-12: Relegated from Premier League. 2012-13: Missed out on Championship play-offs on goal difference to Leicester City. 2015-16: Bottom of the Championship and relegated to the third tier for the first time in 23 years. While Bolton's drop down the leagues has been overshadowed somewhat by their financial troubles off the field, culminating with the sale of the club two months ago, their struggles pale in comparison to Portsmouth - FA Cup winners in 2008 who have twice been in administration since then. 2008-09: UEFA Cup group stage, drew 2-2 with AC Milan at Fratton Park. 2009-10: Relegated from Premier League, finishing bottom with 19 points, having been docked nine points for entering administration earlier in the season. Also losing FA Cup finalists. 2011-12: Relegated to League One. Also deducted 10 points after entering administration again. 2012-13: Suffered second successive relegation, finishing bottom of League One. 2015-16: Reached League Two play-offs.